A strong case could be made for letting the inmates run the asylum. 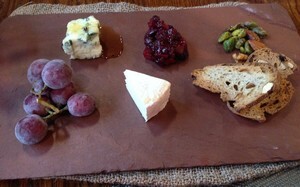 Especially if said asylum is the new pop-up restaurant, Pangea, at the Culinary Institute. It’s been a long time since the Accidental Locavore has eaten well there, but a recent lunch more than made up for past disappointments. “Pangea explores the world’s interconnected foodways while uniting and transforming them.” Yeah, whatever. What that translates to is a series of interconnected dishes that highlight the proteins with fruit, vegetables and grains. Each course has one dish served family style and one plated. If you’re there with a big group that difference might be more apparent, but as we were only two and one was a vegetarian, for us everything was essentially plated. It’s a fixed menu, which the lazy Locavore prefers… so nice to have someone else figuring out “what’s for dinner” (or in this case lunch). It started out with a couple of bowls brought to the table, each topped with a plate adorned with a stripe of sauce and an array of the tiniest vegetables you’ve ever seen! Pity the poor commis who has to prep carrots and beets measured in millimeters! These were quickly swept into the bowl of vegetable broth (trendy broth moment noted). It was delicious and, miraculously, the also-minuscule croutons managed to stay crunchy throughout the bowl. That’s a technique I’d like to learn! 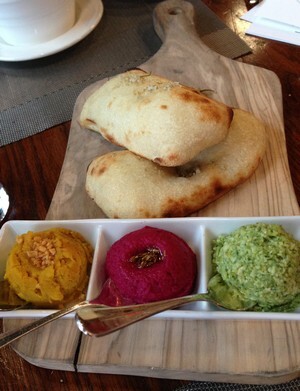 With the soup, flatbread with a trio of colorful dips. Beet hummus, garlic dal and an edamame salsa looked great and tasted as good as they looked! The edamame salsa was particularly good, a wonderful use for what can be a healthy but generally dull snack. This was mixed with garlic, jalapeño and cilantro—must try duplicating it at home! Next up, broth number two, this one also hitting another trend – adding pine needles to flavor things. 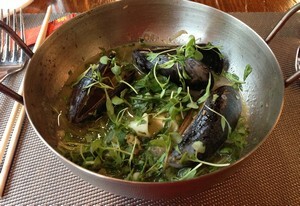 My second broth had a mix of seafood—mussels, lobster and fish along with fregola in a retsina broth. Jack’s vegetarian version swapped the fish for an earthy mix of mushrooms. 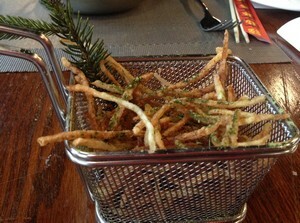 Very skinny (and excellent) fries in a miniature fry basket showed no real sign of the pine needle flavoring except for the bough garnish. Along with this were three pieces of sushi in a roll. 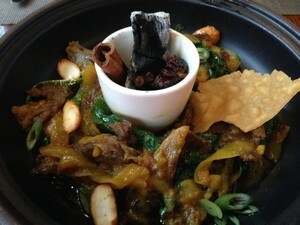 While mine with fluke was first-rate, the vegetarian version was simply amazing! It looked like beautiful tuna-rich and red, but turned out to be tomato. I’m not sure how they did it (especially this time of year) but it tasted as good as it looked! The third course was a tagine of house-smoked duck along with a roasted celery root. 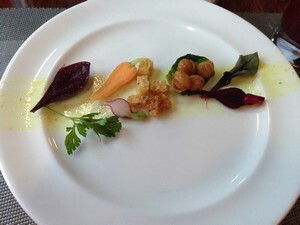 What made this interesting was that it was the winning dish that the student chefs had proposed. It was tasty and the pickled papaya with it was a nice contrast to the richness of the tagine. I liked the idea of “smoking” it with the charcoal, cinnamon stick and star anise. Our server presented the celery root in its entirety, before it was removed to be carved. 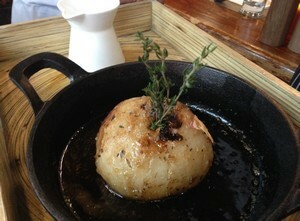 Roasted with thyme and honey, it was another dish that will definitely get tried at home. There was a nice cheese plate with a pair of local cheeses, honey and a fruit paste and a mango-carrot sorbet and meringue that might actually have changed my mind about root vegetables not being dessert worthy. 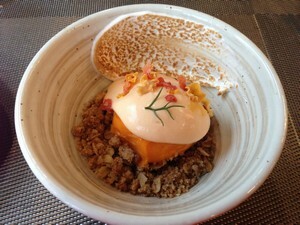 It was sitting on a bed of brown sugar crumble which added a nice crunch to everything. 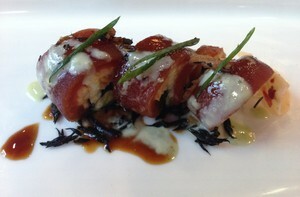 Pangea will be open for lunch through May 5th and dinner through June 11th. It’s only open Monday through Friday (don’t get me started on why the CIA thinks it’s too tough for the students to work weekends) and because the student chefs could be overwhelmed at dinner, I think lunch is the better option. Yes, it was all really well done! This looks like an amazing spread, so many interesting dishes and flavors, plus the plating is beautiful!